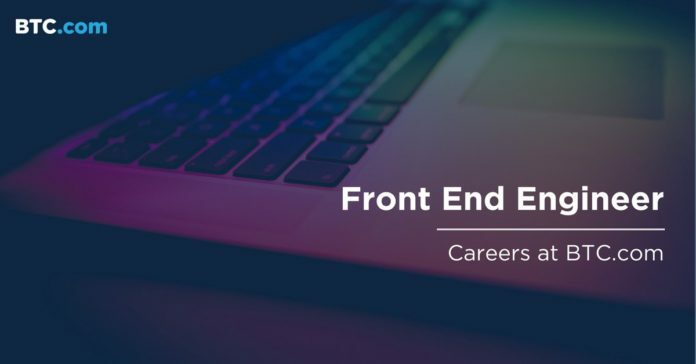 Front End Engineers, join the BTC.com team in Amsterdam! Shape the world of Bitcoin and cryptocurrencies, and bring the revolution of an open peer-to-peer financial system to millions around the world. The BTC.com brand is a part of Bitmain Technologies, the world’s most valuable bitcoin company. Bitmain develops and sells the world’s leading bitcoin miners using Bitmain’s ASIC chip technology. Bitmain is the most recognizable company in the cryptocurrency space and the proud parent of several brands, among them BTC.com, Antminer, Antpool, Artificial Intelligence Sophon and Hashnest. These brands are all global leaders in their own respected fields. BTC.com offers a trusted multi-currency wallet, the world’s most powerful mining pool, API and blockchain explorer. Building on strong adoption of our innovative 2-of-3 signature cryptocurrency wallet technology, we are looking for talented engineers to join our growing team to develop comprehensive and market leading cryptocurrency solutions. We are a start up enterprise with an exciting vision, and our employees are paramount to our growth. We give our employees the room they need to personally grow and develop their career, we have an autonomous approach to management and are continuously striving to grow our employees to their full potential. If this role is of interest to you and you would like to join the number one cryptocurrency company globally then please apply now by sending your CV directly to gurps.sohal@bitmain.com.